If they serve pie in heaven, I bet this would be the one. And I hope so, too, because then, Mikey could have one more piece of pie, sent up on wings of love. Today, hundreds of food bloggers are making a pie for Mikey. Food blogger and writer Jennifer Perillo of In Jennie’s Kitchen suddenly lost her husband, Mikey, on Sunday when he suffered a heart attack. When others asked how they could help, Jennifer made one small request: that we make a Creamy Peanut Butter Pie this Friday–her husband’s favorite–and share it with our loved ones. Hug close those who matter most to you today and let them know just how much you care. This pie is for you. Pre-chill a metal mixing bowl in your freezer. Remove and add the 1 cup whipping cream to the bowl. Using the whisk attachment to your stand mixer, whip on high until stiff peaks form. Transfer to a glass bowl, cover, and put it in the refrigerator. Put the 9 oz of chocolate wafer cookies in the bowl of a food processor (I have a mini food processor and it took some pre-crushing, but it fit). Process until you have fine crumbs. If you don’t have a food processor, you can put the cookies in a zip-top bag, seal it, and bang on the cookies until they are crushed to desired consistency. In a microwave safe bowl, melt the butter. Add the cookie crumbs and mix with a fork. Press into the bottom of 8-10 ramekins. In another microwave safe bowl, melt the 2 oz chocolate chips and 2 oz peanut butter chips at 50% power, stirring every 30 seconds. Using a spatula or butter knife, spread over the crusts in the ramekins. 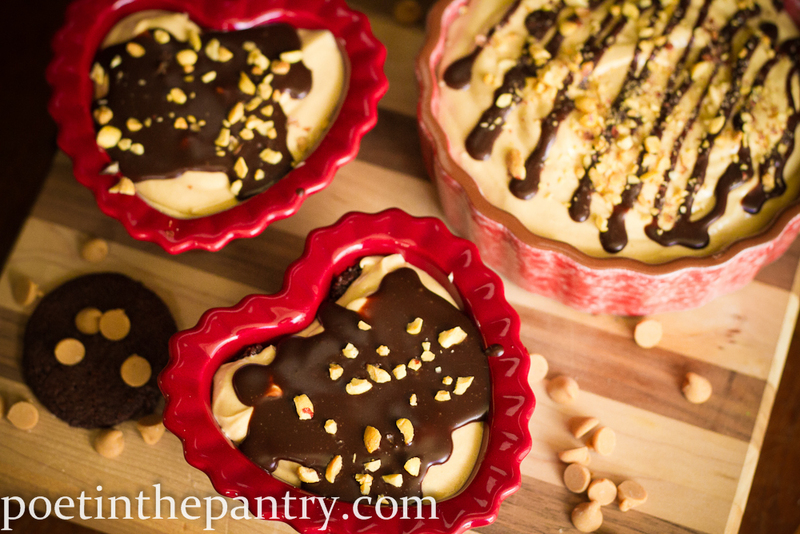 Sprinkle half of the chopped peanuts over the top and put the ramekins in the refrigerator. In the bowl of a stand mixer, blend the cream cheese and peanut butter. Mix at medium speed until light and fluffy. Bring the speed down to low and mix in the powdered sugar. Add the sweetened condensed milk, vanilla, and lemon juice. Take the whipped cream out of the fridge and stir ⅓ of it into the peanut butter mixture to lighten up the batter. Fold in the rest gently. Spoon into the ramekins, distributing evenly among them. Put in the refrigerator for an hour. In a microwave safe bowl, heat the ¼ cup whipping cream until just bubbly (it’ll be 40 seconds or less at 70% power). Pour over the 1 oz chocolate chips and 1 oz peanut butter chips and let sit for one minute. Whisk until smooth. 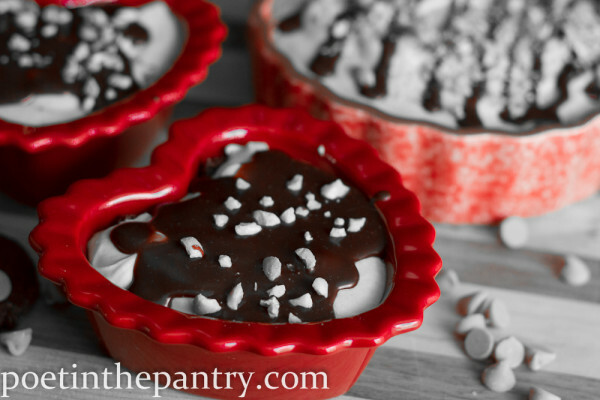 Drizzle over the tops of the ramekins, either as a pool of chocolate or in lines: your choice. Sprinkle the other half of the chopped peanuts over the top and return to the refrigerator for 3 hours before serving. Note: You can replace half the butter in the crust with creamy peanut butter, if you’d like a more intense peanut experience. In that case, be sure to use unsalted butter. 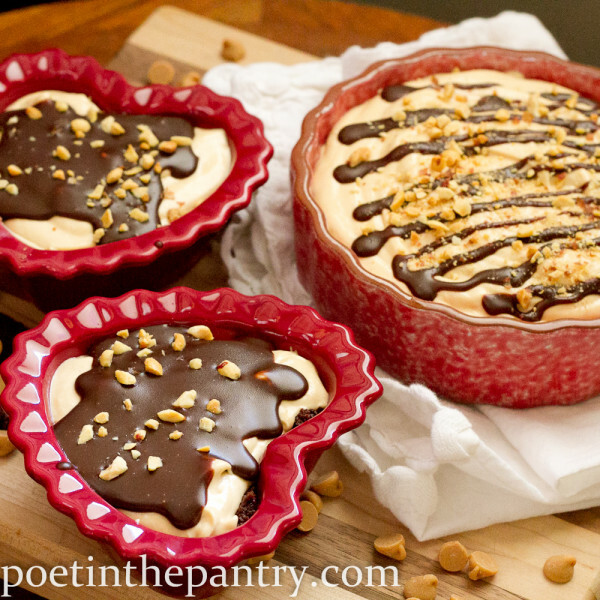 Want to know more about Peanut Butter Pie Friday for Mikey and Jennifer Perillo? Check it out on this page. A lovely tribute. And how adorable are your little pie pans?! Here’s to Mikey. Here’s to you Mikey. Even though I never met you or Jennie; I truly wish that I could have shared your favorite treat with you, instead of in your honor. Fabulous presentation. I bet those taste like heaven too. A sweet tribute and a sweet pie. Beautiful pictures.